In July 2003, we came across this 1894 view of St Leonards Hill, Windsor, the former home of General Amédée d'Harcourt and his wife Sophia in the early 1800s. The page, 330mm x 270mm, and image 200mm x 255mm, had been removed from the original book, 'Beautiful Britain - the Scenery and Splendours of the United Kingdom, published by the Werner Company of Chicago, from their address in London. This is the description that accompanied the photograph. St. Leonards Hill, is situated in the parish of Clewer, Windsor Forest. It was formerly called Gloucester Lodge, it having become the property of the Duke of Gloucester when he married the original proprietress, the Countess of Waldegrave. 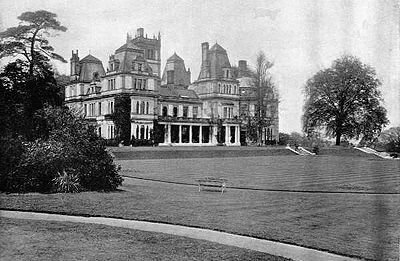 At that time the building was enlarged and much improved, and, together with seventy-five acres of land principally laid out in pleasure-grounds and lawns, is said to have been valued at £10,000. In the beginning of the present century it was the property of General Harcourt, and now belongs to Mr. Barry. 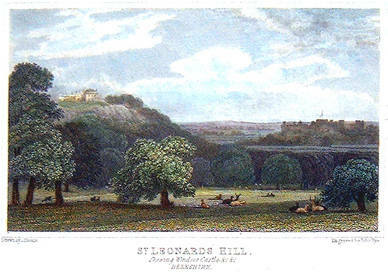 St. Leonards Hill is a name no doubt originating from the chapel of Saint Leonard of Loffeld in Windsor Forest, in connection with which there is still extant a document dating from the time of Edward III. in which a large portion of the forest was granted to John the Hermit. There are many beautiful features of Renaissance architecture in the building, which is finely situated and commands a splendid view. The ground belonging to it would seem at one time to have been a Roman encampment; for, particularly in the early part of the eighteenth century, numerous antiquities have been brought to light in course of building and other operations. Amongst these was a quaint old brazen lamp, unearthed from beneath a stone under which it had evidently been hidden, which was afterwards presented by Sir Henry Sloane to the Society of Antiquaries, and has since been chosen by them for their crest. Numerous coins also, dating from the times of the Emperor Vespasian and the Lower Empire, have been dug up from time to time on St. Leonards Hill, and purchased by the same society. Spear-heads, arrows, pieces of trumpets, various coins and weapons, pots and fragments of ancient earthenware, and other souvenirs, have since been found. An engraving of St Leonard's Hill published in 1820 with the mansion on top of the hill to the left. By the 1990s, the house had become a ruin. This imposing house should not be confused with the nearby St Leonards Mansion, in the grounds of Legoland. The mansion was bought in 1932 by Anna Dodge, the widow of Horace E Dodge, the American car maker. From 1966 the property had been part of Windsor Safari Park, owned by circus owner, Billy Smart, until Legoland selected Windsor for its first theme park outside Denmark.